Dante-enabled mixing consoles were added to the front of house and monitor mixing positions, as well as the control room. 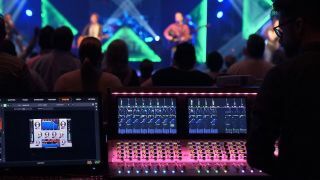 When Josh Cash was hired to be the new tech director at The Met Church in Houston, TX, he made upgrading the venue’s outdated speaker system his top priority. While the church’s services had evolved with the times to incorporate a full praise band with electric instruments and a broadcast-caliber approach to video production, its audio was a different story. Prior to Cash’s hiring, The Met Church’s Jones Road campus had not undergone a major sound system overhaul since a building expansion in 1997. Atlanta, GA-based Scott Clark, a design engineer from integration firm Diversified Engineering Sciences, worked with Bose Professional on a solution to The Met’s challenges. The Met Church system includes a total of 21 ShowMatch modules, eight ShowMatch SMS118 subwoofers, two Bose Panaray LT 9702 WR loudspeakers as side-fills, and four RoomMatch Utility RMU208 modules. Each of the two main arrays (arranged in left/right configuration and flown above the stage) consists of five Bose ShowMatch SM5s, one SM10, and two SM20s (equipped with SM20WG12 waveguides). The center array, installed to satisfy Cash’s design criteria for center localization, consists of one SM5, two SM10s, and two SM20s (equipped with SM20WG12 waveguides). A total of 12 Bose PowerMatch PM8500Ns powers the speakers. “The 8500Ns are eight-channel amps that you can bridge and also group into four channels per output,” Clark said. “The subwoofers require four channels each, so one amplifier can handle two subwoofers each. With ShowMatch, the low frequency needs two channels bridged, and the high frequency needs one channel. And we supplied power to each box individually, so there are no boxes that are paralleled with the line array speakers. The side fills are paralleled and the under-balcony fills are in pairs.” A Bose ControlSpace ESP-880 with a Dante expansion card is used for digital signal processing.